I’ve just been viewing a recently published You Tube video of Dipak Kalra’s presentation to Japanese colleagues in May 2014 on the topic of ‘Design of semantic interoperability info-structure for shared Electronic Health Records’. In it he talks about archetypes as the ‘clinical shapes’ required for building electronic health records. Starting at about the 13 minute mark, he suggests that unless there is some way of defining the ‘clinical shape’ of our health data, then it is hard to analyse and use health data. Each shape is effectively a fragment of an EHR; a precise computable specification or tight ‘blueprint’ for our health information. The result is consistent structures which support consistent EHRs and safe interoperability between health records. The beginnings of this archetype approach began over 14 years ago, but momentum for this journey towards critical mass is really only just commencing in a practical sense: an industry sponsored work program to publish 69 core archetypes (ie frequently used EHR fragments) in a purpose-built on-line collaborative tool is just commencing. Dipak reiterates an increasingly accepted view, reinforced by openEHR in its collaborative online Clinical Knowledge Manager tool, the approach to getting high quality clinical data specifications is no longer regarded as a technical problem, but is increasingly recognised as a socio-technical issue – starting conversations with, and getting agreement between, the main players, the clinicians themselves. 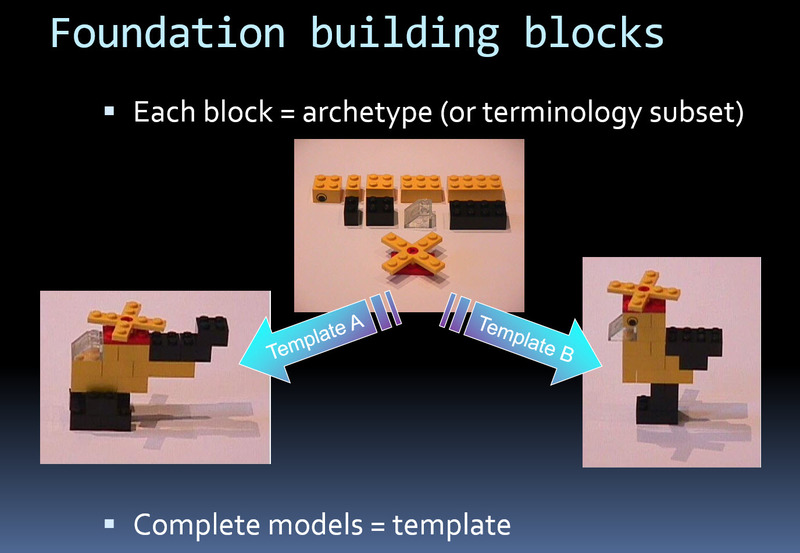 For many years I have borrowed an analogy using Lego building blocks rather than the notion of generic ‘shapes’ – that if we get the foundation building blocks agreed and fit for use in our EHRs (ie clinical archetypes), then they can be re-used in multiple contexts and combined in any permutation or combination to represent the clinical documentation that we need. Enter the ubiquitous Lego block. Each block is easily identified by its color, shape, the number of nubs on its surface and how it connects with other blocks. It is intended to be a single component of a varied, coordinated and cohesive universal system: compatible with other blocks, precisely manufactured, and can be aggregated, used and re-used in a variety of block combinations to represent different real objects. In the example below, the chicken or the helicopter can each be constructed using the same set of blocks. In the same way, representations of different clinical documents or messages can be constructed using a common set of consistent archetype building blocks. Think of the core documents/messages that support continuity of care or are the basis for every clinical consultation – they all contain slightly different representations of common components: diagnosis/problems, medications, allergies, family history, lab reports, imaging reports, history & examination findings etc. This entry was posted in Clinical modelling and tagged archetype, block, CKM, EHR, lego, semantic interoperability by Heather Leslie. Bookmark the permalink.